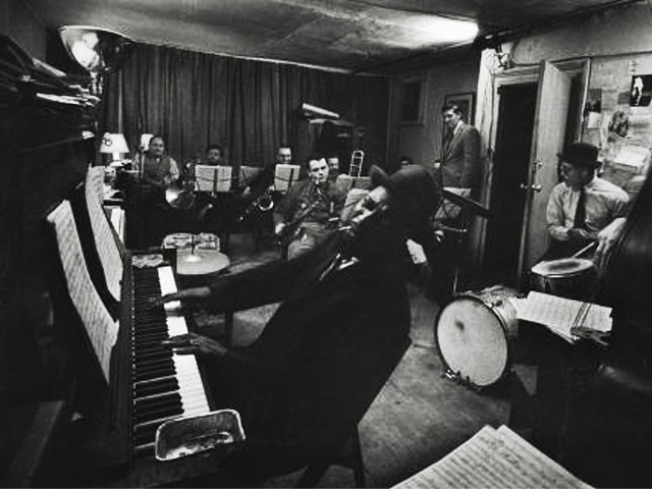 Thelonious Monk and crew at the Jazz Loft, part of the W. Eugene Smith exhibit at NYPLPA. He’d built a name for himself covering World War II in brutal photographic detail, but in 1955 famed lensman W. Eugene Smith quit his longtime job at Life magazine to snap shots of musicians in Pittsburgh, which eventually led to his Jazz Loft series. What started as a three-week assignment turned into four years of shooting for Smith: He ditched his family life upstate and moved into a dilapidated loft building at 821 Sixth Avenue which was a revolving door for jazz history in the making: a post-gig standby hangout for everyone from Thelonious Monk (pictured) to Charles Mingus, and the night-owl entourage they attracted. Starting tomorrow, an exhibition at the NY Public Library for the Performing Arts highlights Smith’s work from this era with more than 200 atmosphere-drenched images (check out the NYPLPA’s preview gallery) plus a multimedia bonanza that includes audio and 16mm footage of jam sessions, conversations between legends and more.